A peg legged pirate is searching for treasure with the help of a young boy, teen girl and a parrot. They'll have to fight Natives and his former crew on the way. Musical version of the story in which Dr. Henry Jekyll experiments with scientific means of revealing the hidden, dark side of man and releases a murderer from within himself. 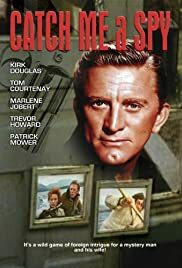 This terrible little film is clearly among the worst Kirk Douglas ever made. It's not as bad as "Saturn 3"...but what is?! When the film begins, a couple in honeymooning in Bucharest (???). What they don't realize is that the guy working in the hotel is NOT an employee but a smuggler (Kirk Douglas). Because of his actions, the husband is arrested and his wife (Marlène Jobert) is left wondering what happened. Even though it makes no sense at all, she later ends up handcuffed with the smuggler and then on the run with him...and it's all supposed to be kooky and romantic. Well, to me it just comes off as annoying and nonsensical...and Jobert's voice often grated on me. The smuggler says at one point "...you are such a child"...and her voice does sometimes sound like one. Poorly written, poorly acted and boring.